I'm going to straight to the point with this release. Everything about this story should have been brilliant, a good Doctor, a great companion, a great storyline concept, Mike Yates. But unfortunately, none of these things quite work. This is the first story in the Locum-Doctors trilogy that brings the first 200 releases of their main range. The problem with this story is that the Seventh Doctor isn't thrown into the events of this story. He is there at the beginning and then has to team up with Jo Grant and UNIT rather than meeting an older version of Jo Grant and the various UNIT characters much like the Sixth Doctor and Jamie in The City of Spires. Another reason that this one story doesn't work is that it is trying to be a Pertwee era story which doesn't work because the Seventh Doctor is so different from the Pertwee Doctor that he doesn't fit into the time author Nicholas Briggs is trying evoke. The Seventh Doctor era is too dark for the Third Doctor's time. Also there is hardly any time for Captain Yates with Richard Franklin giving a good performance in the few short scenes he is in, it's a shame because he is a great character. What is even more of a shame is that this is supposed to be the beginning of a new trilogy to commemorate 200 hundred releases and the idea is a good one, with the surviving doctors replacing those actors who are sadly no longer with us. This story just doesn't come out right. If Nicholas Courtney who played the Brigadier on screen was still with us, his appearance would have been a given and it would have added another layer of intrigue to this release with the Seventh Doctor having already met an older version of him in the television serial, Battlefield. However that is the tragedy of the Third Doctor era, that so many of the great Doctor Who legends are no longer with us, Jon Pertwee, Caroline John, Nicholas Courtney, Roger Delgado and Elisabeth Sladen are all no longer with us so, while I understand that there can only be a few stories told from this era with the surviving cast, this isn't one of them and I feel it should have been scrapped in the planning stage and subsitueted with another. Sorry, but that's my opinion. I find there is little to enjoy about this release. 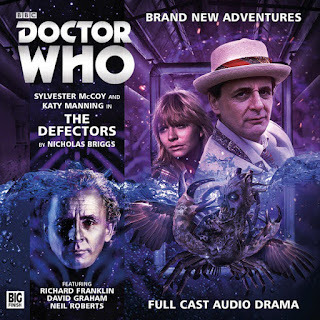 Yes, sadly the whole thing is a bit of a mess and doesn't work, the mish-mash of two completely different eras doesn't sit well with the darker Doctor paired up with the bright Jo Grant, played wonderfully by Katy Manning and the lack of Mike Yates feels like his inclusion was a missed opportunity. Well, after that rant and rave, I feel that all there is left to say is that if you are looking for a slice of Third Doctor era, then look somewhere else, you won't find it here, the whole thing is one big shame full of concepts that don't work and missed opportunities. THE DEFECTORS, WRITTEN BY NICHOLAS BRIGGS AND STARRING SYLVESTER MCCOY AND KATY MANNING WAS RELEASED BY BIG FINISH PRODUCTIONS IN APRIL 2015.